Stylish and functional, this shade will bring out the best in a room, while blocking out light. A top-of-the-line roller shade, designed for the resourceful homeowner. It includes an aluminum cassette valance, a cordless mechanism that is unmatched, in beautiful, durable fabrics. This combination will enhance your overall decor and be a perfect complement to your new home update. The fabrics will filter the light beautifully during the day while providing privacy at night. The aluminum hardcover valance is sleek and durable. It includes a matching fabric cover for a complete and premium look. The cordless mechanism is called free-stop. Unlike your typical rollers this one is smooth and easy to operate; no hassles or constant tugging. It works as you'd expect. Many of our customers who try it tell us this is simply the best mechanism they've used. Being cordless, this shade is safe for both children and pets. It is ideal for kitchens, bedrooms, offices, living rooms, family rooms, nurseries, children's rooms, bathrooms, and more. 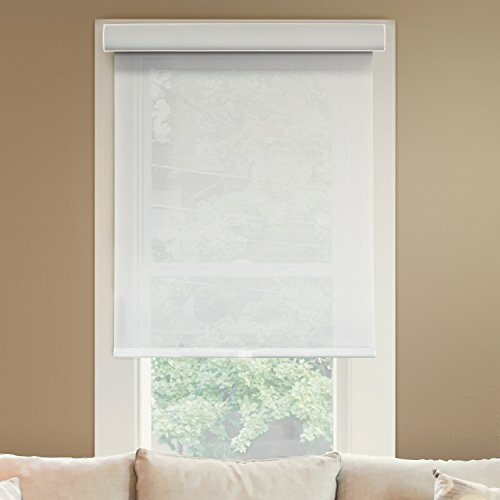 The cordless roller shade is capable of inside or outside mount. Installation is very easy. Simply install the brackets either on the Ceiling or the wall, push to clip the head rail onto the brackets. Measurement: pre-cut the width includes a half inch deduction. The fabric is also shorter by an inch on both sides in order to accommodate the cordless mechanism. If you have any questions about this product by CHICOLOGY, contact us by completing and submitting the form below. If you are looking for a specif part number, please include it with your message.